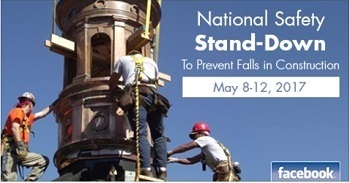 To raise awareness of fall hazards, OSHA, the National Institute for Occupational Safety and Health and the Center for Construction Research and Training will hold the fourth annual National Safety Stand-Down to Prevent Falls in Construction from May 8-12. The weeklong event encourages employers to pause during their workday for topic discussions, safety demonstrations, and trainings in hazard recognition and fall prevention. As part of the Stand-Down, the National Roofing Contractors Association will host a free webinar on May 8 to discuss the hazards present after a worker has fallen from a roof and his or her personal fall-arrest system has deployed or activated. NRCA will also host a live Facebook chat on May 10 to discuss trending roofing and construction safety topics. For more events being held across the country, see OSHA’s Stand-Down events page. 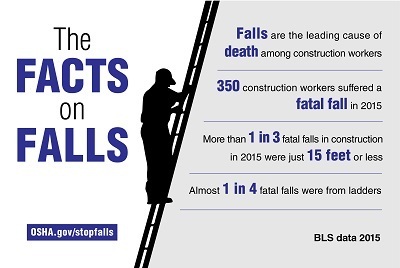 Falls are the leading cause of death for construction workers, accounting for 350 of the 937 construction fatalities recorded in 2015. These and other facts about fall hazards are highlighted in new resources from OSHA that employers can use in their discussions with employees during the National Safety Stand-Down. Two videos have been posted on the Stand-Down homepage and a series of infographics can be downloaded from OSHA's Fall Prevention Campaign webpage. We also encourage posting of the new videos and infographics on social media using the hashtag #StandDown4Safety. The Hispanic Contractors Association de Tejas held an OSHA 10-Hour Construction Training (available in English and Spanish) April 28-29. This course was designed for construction workers, construction foreman, superintendents and project managers. Upon successful completion of the training course, participants will receive an OSHA 10-Hour Construction Outreach Card. Through its alliance with OSHA, the Hispanic Contractors Association de Tejas has provided the 10-hour construction training to more than 5,800 workers. OSHA's Dallas Area Office and TEXO Construction Association are helping to raise awareness about workplace safety and health among young people in Texas. In April, the organizations provided free safety training to MacArthur High School students interested in construction careers. The training focused on finding and fixing fall, struck-by, electrocution, and caught-between hazards. The students also learned about workers' rights and employer responsibilities. 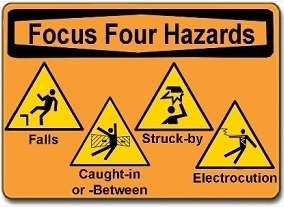 OSHA's Philadelphia Region and the Mid-Atlantic Construction Safety Council initiated a "Focus Four Hazards" campaign, which was launched in February and will conclude in May. The goal of the campaign is to raise awareness in the recognition, evaluation and control of fall, struck-by, electrocution, and caught-between hazards, which account for a vast majority of the injuries and fatalities in construction. Each month is dedicated to addressing one of the focus four hazards, whereby the organizations share toolbox talks and other training resources with stakeholders throughout the region. Visit OSHA's Construction Industry webpage for information on identifying, reducing and eliminating construction-related hazards. OSHA and the Central Texas Chapter of the Associated Builders and Contractors recently renewed their Strategic Partnership to provide members with best practices for construction safety. The Central Texas Chapter covers 23 construction contractors and their employees. Last year, the partnership held a Safety Rodeo in which workers were trained on fall protection, scaffolds, aerial lifts and personal protective equipment. Partners also conducted 16,000 self-inspections and corrected more than 10,800 hazards. The partnership’s efforts last year resulted in a combined days away, restricted and transfer rate that was 50 percent below the rate for 2015. For more information, see the success story. The Service, Transmission, Exploration, Production Safety of Pennsylvania Network signed a two-year agreement to provide workers and employers, particularly in the oil and gas drilling and servicing industries, with guidance and training resources that will help protect the health and safety of workers. The Department of Professional Development and Continued Education of the Professional College of Engineers and Land Surveyors of Puerto Rico renewed a two-year agreement to protect workers from hazards, particularly in the areas of engineering and land surveying. Last year, the alliance sponsored more than 30 seminars focusing on safety topics including confined spaces, fall prevention, control of hazardous energy, and soil engineering. The Ironworker Employers Association of Western Pennsylvania Inc. renewed a five-year agreement to reduce and prevent exposure to hazards associated with the construction industry. The Safety Alliance For Excellence renewed a five-year agreement to address construction industry hazards related to the four leading causes of fatalities - falls, electrocution, struck-by, and caught-in/between. The Great Lakes Construction Association renewed a five-year agreement to protect construction workers from hazards such as falls, electrocutions, struck-by objects, and caught-in/between. For more information, see the news release. The Radford Company, a valve manufacturer in Tulsa, Okla., contacted OSHA's On-site Consultation Program for help improving workplace safety. Management worked closely with consultants to update their safety program, develop new employee training, and institute new injury and illness recordkeeping procedures. These and other major safety modifications earned Radford acceptance into OSHA's Safety and Health Achievement Recognition Program, which recognizes small business employers who have used the On-site Consultation Program and operate an exemplary safety and health program. Since receiving SHARP approval, Radford has had an injury rate below the national average for its industry, while increasing its operational productivity. For more information, read the success story. A contract worker was seriously injured when a trolley struck and crushed him inside the Wal-Mart Distribution Center in Brundidge, Ala. OSHA cited Wal-Mart and the worker’s employer, Swisslog Logistics Inc., for serious and willful violations for exposing workers to caught-between, struck-by and crushing hazards and for failing to implement lockout/tagout procedures. Wal-Mart and Swisslog Logistics were proposed fines of $139,424 and $126,749, respectively. OSHA issued multiple citations to Napoleon Spring Works Inc. in Archbold, Ohio, after three inspections initiated as a follow-up to a 2013 case and in response to two incidents, on Nov. 2 and Nov. 7 of last year, where employees suffered amputations. In just over two months, there were three amputations at the employer’s facility. The follow-up inspection found that the company had abated the specific hazards cited in 2013, but failed to apply those same safety requirements to other pieces of equipment at the same facility. In these three most recent inspections, OSHA cited the company for violations related to mechanical power press operation, hazardous energy control, machine guarding, electrical safe work practices, and forklift training. Durcon Inc. has been issued citations for 35 safety and health violations. OSHA inspected the Taylor, Texas, chemical resistant coatings manufacturer in response to a complaint about silica exposure. 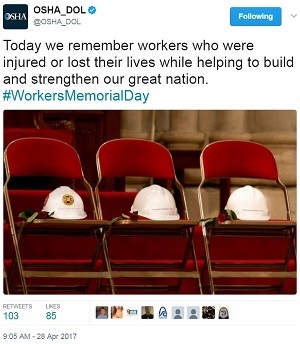 Inspectors also found other violations including: workers exposed to being struck by falling loads; failing to provide workers with personal protective equipment and effective respiratory protection; combustible waste materials soaked with flammable liquids stored in improper receptacles; and failing to implement a confined spaces program. The Nevada Occupational Safety and Health Administration cited Clay Davis in Carson City for exposing workers to fall hazards. Nevada OSHA inspectors concluded that the company failed to provide proper fall protection for two employees working on a low slope roof 10 feet above a lower level. The violations included failure to provide guardrails, safety nets, personal fall arrest equipment, as well as warning line and safety monitoring systems. The company was previously cited for violations of this standard in 2015 and 2016. The California Division of Occupational Safety and Health cited Good View Roofing & Building Supply Corp. in San Francisco after a worker died when his forklift tipped over the unguarded edge of a ramp. Cal/OSHA inspectors determined that the company failed to inspect and identify workplace hazards, provide clearly written safety instructions on forklifts, and ensure that all workers comply with forklift safety requirements. For more information, read the news release. Watch our latest video to learn how you can participate in Safe + Sound Week. QuickTakes is emailed free twice monthly to more than 180,000 subscribers. You can receive it faster and easier by subscribing to the RSS feed that delivers almost instant information. Visit OSHA's RSS Feeds Web page to subscribe.